I know. I can't help it. She kinda looks how I feel right now, a little bedraggled and run over. Part has to do with this crazy rain today. The other part, well, whatever, it's a magnetblog, dudes. So, I bought this magnet at the Yale Center for British Art - such a great museum, for the art, for the architecture. Still, I squealed a little dance of joy because this was my best find of the day. I was so happy to find this as a magnet, because I saw this painting at the Tate in London, and they didn't have the magnet for it! 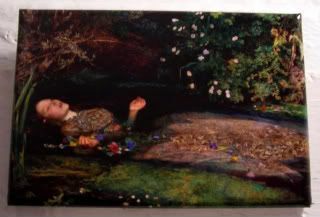 I absolutely love this painting of poor drowned Ophelia, Hamlet's sister. I'll concede it's a more than a little dark, and I know when I saw it in person, it irked crap out of me, because I was in London and not able to see David Tennant's Hamlet and I was still ticked over that and will likely not get over it for a while, but whatever, because you know he's totally coming to Broadway at some point in his life, and it'll probably be in a play that I'll never want to go see, but will go see more than a couple times, and probably stalk the theatre door, just because he'll finally be on my home turf. Anyway, moving on. I'll leave the background learning up to you and the Tate description, mostly because I'm refusing to use the word Pre-Raphaelite in a magnetpost and not really know (or honestly care) what it means. Of course, now I know having read that description what it means, but I'm still not using it. The very word just seems too, too lofty here on joy magnetism. So, lay on, Macjoy. What? Oh, like I wasn't going to pun it. Or include David Tennant in reference to this particular magnet. Hahaha. Nope. I'm not bitter at all. Why? Why do I always think that Ophelia is Hamlet's sister? Kudos to Jenny for pointing it out. But I shan't fix it above. Because I'm kinda wondering what my mental block is about it! She's Laertes' sister. And yet, in my head, Ophelia/Hamlet, sibyay. You'd think I didn't go see Hamlet. I did, though. I have the notice about David Tennant's absence to prove it. Grrr. I am turning into a Hamlet fangirl: the Ashland, OR Shakespeare theater season runs from April to October, and when I saw their line-up this year, I said, "Ooh! Hamlet!!" Wait, I don't like that play...? Apparently just due to repetition I'm now a fan! Hopefully Ashland's Ophelia does a better job than the abysmal performance given by the woman in the filmed Tennant RSC version.